Meet the faces behind the wit and wisdom featured on the UC blog! Hello! My name is Anna Herff and I am a senior majoring in Communications with an emphasis in Public Relations. I am a Marketing Assistant here in the UC and love the experience this position gives me! Outside of the UC I am involved in my sorority on campus and PRSSA. In my free time I love to watch the university wrestling team and my favorite TV show, The Office. Hello! 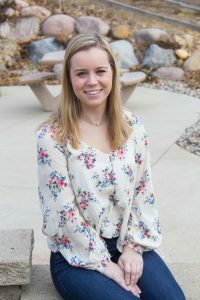 My name is Lauren Roloff, I am a junior majoring in digital marketing and minoring in sports management and advertising. I am a new marketing assistant in UC Graphics and Marketing. I am excited to get started, get to know everyone, help with marketing all of the great events the UC has to offer. Outside of working in the UC, I am involved in many other students organizations on campus including Club Softball and American Marketing Association. In my free time, I enjoy watching Gilmore Girls, listening to Thomas Rhett and Demi Lovato, and raising sheep with my family! Hello! My name is Taylor Miller, I am a senior majoring in broadcast journalism and minoring in marketing. I work as a videographer in UC Graphics and Marketing. I really enjoy working in the UC because you get to meet great people and have real-life experiences working with customers and making sure they are satisfied with the finished product! Besides working for the UC, I am also the marketing director for the campus radio station and a member of the leadership involvement team. In my free time, I play for the UWW club softball team, go on adventures with my friends and listen to a lot of music! My name is Camden Horner and I am a Junior majoring in Business and Marketing Education here at Whitewater. I work down at Warhawk Alley where I am also the Trivia Coordinator. I love my job because I am able to interact with a bunch of different people on campus and I’m also able to work with other departments in the UC! When I’m not working at the Alley or going to school, you can find me hanging out with my friends or watching sports with my roommates. Hello! My name is Jessica Rossignol and I am a junior. I am double majoring in Finance and Marketing, with an emphasis on Digital Marketing. I am one of the Marketing Assistants here in the UC. Working in the UC allows me to use my creativity to achieve a common goal, and I am excited to see where this year will take me! Outside of the UC I am a part of the Navigators, and I love to travel when I get the opportunity. I also enjoy working on art projects, whether it be crafting or painting, and spending time with friends! Hi, my name is Dan Vlach and I am a Senior double majoring in Human Resource Management and Marketing. I am an Entertainment Assistant here in the University Center. Working here in the UC has been absolutely amazing because, I get to work with fantastic coworkers, I get to meet and run different events for the different artists we bring to the Down Under, and just the overall inclusive culture this place bring to campus. In my free time I enjoy hanging out with my friends, going on dinner dates with my girlfriend, and going on those random adventures. Growing up in Wisconsin, I have come to one true realization: I really love da Packers. Hello! My name is Shauna Volkening and I am a Senior majoring in Graphic Design and minoring in Marketing. I am currently a Graphic Designer in the UC. Working in the UC has helped me to develop my creativity and problem solving and I love getting to work with so many fun and talented individuals every day! When I am not at the UC, I enjoy weight lifting, hiking, reading, doodling, crafting, and talking about anything related to Disney or Harry Potter. Hello! 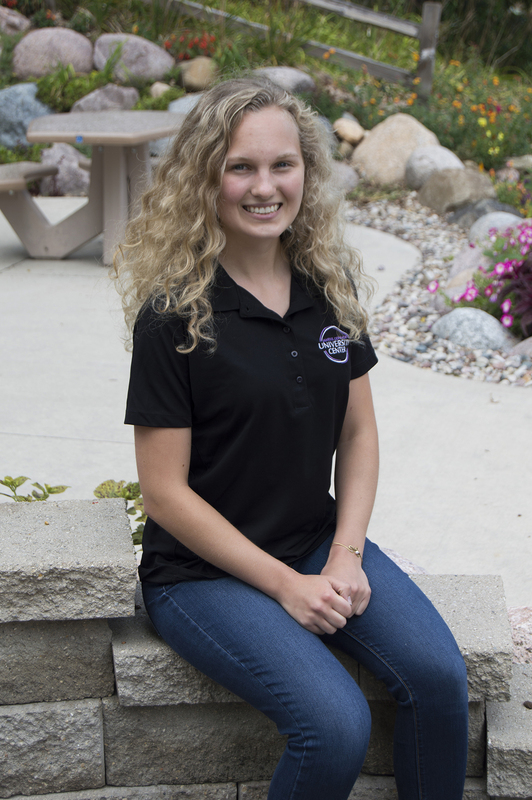 My name is Paige Mayer and I am in my senior year here at UW-Whitewater. I am working towards my bachelor’s degree in Marketing with a Digital Marketing Emphasis. I work as an Entertainment Assistant in the UC. This is my first year working in the UC and I already love the environment and people I work with. I’m excited to meet a ton of new people and get them more involved on campus! When I have free time I love hanging out with my friends, volunteering, and going to music concerts as much as possible! Hello!​ My name is Jordyn Dutkiewicz, and I am a Junior majoring in Marketing. I am an Entertainment Assistant in the University Center. I enjoy working in the UC because I have met so many unique people, and love planning and promoting events to make campus a fun place. I love country music, playing volleyball, and spending time with my family and friends. Hello! My name is Becca Bailey, I am a senior majoring in public relations with a minor in journalism. This is my first semester working as the UC videographer and I am super excited to work with a fun and creative team to put together some awesome videos and promos. Outside of working in the UC I am an active member of the on campus org PRSSA and in the past have also had my own radio show on 91.7 the edge and was a co-host for UWW TV’s Wake Up Whitewater. In my free time I enjoy hanging out with friends, pointing out any cows I see on road trips, and am always ready to share one of my witty puns. Hello! My name is Ben Yang and I am a sophomore majoring in journalism. I am one of the Desk Attendants at the UC front desk. I like working in the UC because the staff is great and I like to think that I make a positive difference in student’s, faculty’s, and visitor’s lives when they come to the desk, even if it is for the smallest thing. Besides working for the UC, I am also the assistant multimedia manager for the Royal Purple. In my free time, I like to hang out with friends and family and watch a bunch of television shows/movies on Netflix and Hulu. My name is Mackenzie Murray, and I am from Franklin, WI. I am currently a junior at UW- Whitewater studying Marketing. I work as an Entertainment Assistant where I help plan, promote, and execute events for our University. Outside of school and work, I stay involved in organizations and make time for personal hobbies that I enjoy. I love to spend time with my family and friends as well as traveling and cooking as often as possible. Hello! 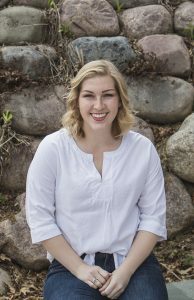 My name is Chelsea Weber, I am a senior majoring in Digital Marketing. I’ve worked front desk at Warhawk Alley for four years, and recently had the opportunity to pursue a Marketing and Events Internship here. I love my job, I’d have to say the best part is the people I work with. Being able to run different events and meet so many people makes for an awesome job. In my free time I enjoy going on road trips, to concerts, and attending trivia nights.